A project normally starts at position 1 1 1 1 (as shown in the LCD, in Bars mode or in Bars and Time mode). You can move the project start point to an earlier position, allowing upbeats or program change commands to be played before the first downbeat. You can also move the project end point; for example, to remove unused bars at the end of the project. Drag the start-of-project marker in the ruler to the left or right. Drag the end-of-project marker in the ruler to the left or right. Set the value in the LCD’s numerical Project End display (by click-dragging or double-clicking the value). Note: If the Project End display doesn’t appear in the LCD, Control-click the LCD and choose Customize Control Bar in the shortcut menu. Select the Tempo/Project End checkbox in the Customize Control Bar dialog. 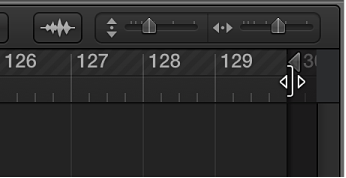 During playback, a project stops when it reaches the end-of-project marker. When recording, the end-of-project marker moves to accommodate the end of the recording (if recording extends past the current position of the marker).